What kind of information does the MetaMap give about MSSIs? If I want to find an MSSI that I know about, how can I see if it's included on the MetaMap? Is the MetaMap available in other languages than English? How can I tell you about an MSSI that I think should be added to the MetaMap? How many MSSIs are there on the MetaMap? Can I print the MetaMap? Why can't I get the MetaMap to appear on my screen? The MetaMap is a learning tool which looks like a subway map. The goal is to help those interested in information science to understand metadata standards, sets and initiatives (MSSIs) in this area. The MetaMap includes MSSIs and organisations deeply involved in the development of MSSIs. 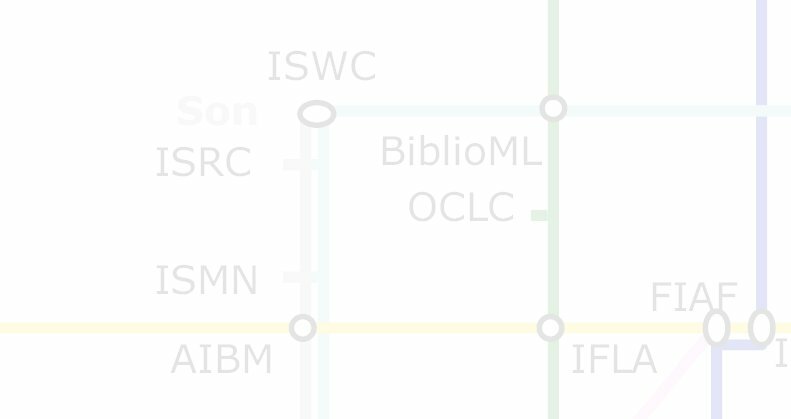 Each MSSI is represented as a subway station on a line. Each line represents a theme. MSSI is an acronym which stands for Metadata Standards, Sets and Initiatives represented on the MetaMap. On the map itself, if you place the mouse over an MSSI a window pops up to give you its full name (most MSSIs are expressed as acronyms). In addition, if you click on the MSSI a window comes up which gives you an explanation of the MSSI as well as links to its official Web site and to other Web sites of interest. The easiest way to check whether an MSSI is on the MetaMap is to use the acronym index. Just choose "Metamap with index" from the menu at the left. The MetaMap is also available in French (it's called the MétroMéta). The acronyms are mostly in English, but the explanations of the MSSIs are given in French, and many have links to French-language resources. We hope people from many other language communities will help us build versions in other languages. If you can help with this , please let us know and we will provide you with guidance, as well as the necessary computer files and templates. To communicate with the MetaMap team, whether it's to suggest an addition or a modification, to advise of an error or a link that doesn't work, or to offer comments on the project, send a message to Professor James Turner at the ÂŠcole de bibliothÃˆconomie et des sciences de l'information at the UniversitÃ© de MontrÃˆal. You can fill out the online form available on this site by using the "Comments" link on the menu, or send e-mail to James Turner. As of February 2005 the MetaMap has 191 stations. It is updated regularly, reflecting activities in metadata development worldwide. Yes, just click on "Printable MetaMap" on the menu at the left. This will bring up a page with a JPEG image of the map that you can print, without the popup windows and the links. The simplest definition is that metadata is data about data. Another simple explanation is that metadata describes information resources in a structured way, whether the resource be a text, a still image, a moving image or a sound file, or a combination of these. Resource description refers to both form and content. For example, it could be the title of a document or other resource, or the name of the author, or the date the resource was created. But the description can also be about the file format, the software needed to consult the resource, or about the way the resource is structured. In a word, metadata can be described as any information about a resource which helps to find it, to describe it, to interpret it, or just to use it. For further information, click on "What is metadata?" in the menu at the left. The MetaMap was constructed using SVG, a format not yet included in some versions of some browsers, so you need a plugin to be able to display it. Without the plugin, you can't display SVG and thus you can't display the MetaMap. However, the problem is easy to fix. Just click on Adobe SVG Viewer to get the plugin. You can get information about installing SVG and read about its features on the SVG Viewer guide page. SVG stands for Scalable Vector Graphics. It is a recommandation of the W3C, based on XML, for two-dimensional vector graphics. SVG also supports animation, as you can see on the MetaMap.